Reuse is the forgotten R of the three R's. We currently have a materials chain that goes something like this: harvest resource, manufacture, distribute, use, dispose. Recycling often involves breaking down the product into something as close as possible to the original feedstock. This means that all the energy that went into it is lost. Glass is a good example. Recycling uses far less energy than creating a product from raw virgin materials and it is very important that it occurs, but why do we destroy things that are in perfectly usable condition? The things that I have read about reuse have all been focussed on reusing items in the home and giving or selling them to other people who can use them (which are both important). I want to see industry take responsibility and start collecting items for reuse, rather than recycling (wherever possible). We have seen this happening our whole lives: glass soda bottles. Every time you took a glass soda bottle back to the store and had your deposit paid back you were putting a bottle into the reuse chain. The reuse chain works like this: instead of disposing of something it is taken back to the distributor (the store it was bought from). When the manufacturer makes deliveries they also collect the items for reuse. At the factory the items are inspected and cleaned. 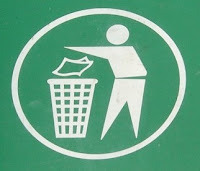 Any items that are unsuitable for reuse are recycled, and the rest is reused. This means far less energy is expended on recycling and manufacturing new items which could have been reused. The easiest thing to imagine this working with is glass bottles and jars of any type, but why not expand this to everything? Why not start designing reuse into our products? There would be huge savings for manufacturers, as they would not need to keep buying new materials. The only costs are the collection and logistics, which are already in place for the distribution of the product. Packaging is a great example. If packaging can be made durable enough to be reused multiple times then consumers could just keep returning that packaging until it reached the end of its life cycle. It does require a rethink of how we design, package and distribute things, but the benefits would be great for everyone – both manufacturers and consumers. Every year, 80 million PET bottles are collected from landfill sites to make IsoTherm. One hundred and seventy one 500ml PET bottles go into a 6 kilogram roll of IsoTherm. The polymer from PET bottles has a higher intrinsic viscosity which means it has greater molecular weight. This creates a better rigidity in the fibre with better resilience and loft compared to ordinary textile fibre. Simply put, recycled PET is best!